I've had a three crashes and one brief hang over the past three months and two of these at least appear to be due to Wacom_TouchUser.exe. I had one today. When changing focus from Painter to Chrome, the display hung for a second, then both windows disappeared followed by the display. My cursor was still visible and operated OK but the screen was black. I had to reset (and on reboot found my Painter profile was corrupted, as were my LibreOffice settings, likely by the forced shutdown). Windows successfully diagnosed a low virtual memory condition. The following programs consumed the most virtual memory: Wacom_TouchUser.exe (15684) consumed 19613175808 bytes, Painter 2018 x64.exe (2724) consumed 2227904512 bytes, and avp.exe (4056) consumed 374169600 bytes. What on earth was Wacom_TouchUser.exe doing taking 20Gb of virtual memory? I don't even have 20GGb of virtual memory, it's limited to 10. More info: Please don't suggest using old drivers. The previous driver immediately prior to this one doesn't work and I was on an old driver when the first crash happened. I upgraded to see if it would fix it. Also I see this isn't a new problem. http://www.forum.wacom.eu/viewtopic.php?t=1171 That thread a year old with no posted solution. Seeing as Wacom evidently have no clue I'm trying the Watchdog function in Process Lasso, which in theory will restart the Wacom process if it takes up more than 100Mb of virtual memory. I wonder if Wacom will refund me the £20 it cost to purchase this s/w. Nah. Unfortunately, we were never able to reproduce this in our tests. There was some suspicion that another driver was causing interference but this was never conclusive due to lack of feedback. It has been hard to gather data about this issue since it's happening very seldom and we haven't been able to collect enough information. It would be very helpful if you could collect some logs and contact our support and share this information. What I described in my second post seems to have fixed it. Better spend £20 than wait for Wacom to get round to it. Process Lassoo shuts down the process if it gets out of control. It makes no difference to the workings of the tablet other than touch is disabled, which is fine as I never use it. Ideally we should be able to prevent the process from running but I image that's internal to whatever the master process is. Over the past year, I have experienced many crashes due to this same issue: wacom touch user mode driver memory maxed out. I have an Intous Pro medium and keep updating Windows 10 and the tablet drivers, but the issue occurs seemingly randomly. I've tried reverting to older drivers in the past which did not fix the issue. I tried redirecting the temp files to a larger hard-drive than the solid-state. The company I work for uses a crash plan software service. I thought that was interfering, so I uninstalled that and it seemed to help for a while, but I just experienced another slow down until I ended the service in task manager. I have disabled the touch function as I only use the pen, but the issue still persists. In the past, it would "black screen" my computer 3 times a day, or sometimes twice in an hour, or sometimes it would not overload for days or weeks. It seems many people have also experienced this issue whether they actually report it or not. It might have something to do with a windows memory leak, but I don't know enough about it all, I'm just an artist who does the same type of work every day with the same programs running. This memory usage does not make sense and I wish I could get it fixed. Hi folks, is there any words from Wacom on this? I am still having this issue. I am having the problem 2/3 times a day and by the time I realize its about to happen the machine locks up and cant even end process. Its really messing with my workflow. What information do you folks at wacom need in order to try and find this but because if this doesn't stop I will have to get my studio to by us non wacom tablets. Its a real killer of a bug. We need details about the Operating System and log files. The team suspects that some 3rd party software is causing this issue but have yet to be able to replicate the issue when testing. A year ago I exchanged quite a lot of emails with the Wacom support team and did many tests in addition of sending many logs, but nothing specific could be found and eventually communications ended. I ended up using Linux for a good while, where such problem would not appear. Recently I started using Windows 10 (build 1809) again on a fresh installation and the "runaway memory leak" (the Wacom support will probably remember this definition I gave them) from Wacom_TouchUser.exe could still be occasionally observed with the latest drivers. I haven't really installed many programs or used the operating system for more than a couple days. So far my workaround is killing the Wacom_touchuser.exe process to prevent such events. Besides having this long-standing bug corrected, it would be even better however if the touch functionality could be completely disabled so that the process wouldn't even appear. Thank you. I know the driver team has recently acquired more information on this issue and are working on it. I will share your information as well. On another note, a while ago, there was some suspicion that Logitec drivers with the Wacom drivers could be causing the issue. If you uninstall the Logitec software, does the problem persist? I always keep the Logitech Gaming Software disabled and prevent it from autostarting when Windows boots up, so I wouldn't normally think it's the cause. As of currently, the only Logitech-related process that seems to be active is one called "LogiRegistryService.exe". A few days ago I have tried uninstalling the Uninterruptible Power Supply software from APC (PowerChute Personal Edition 3.0.2), which on the other hand is always enabled and tends to cause unexplainable I/O write events when hovering pointers such as mice or also the Wacom stylus. 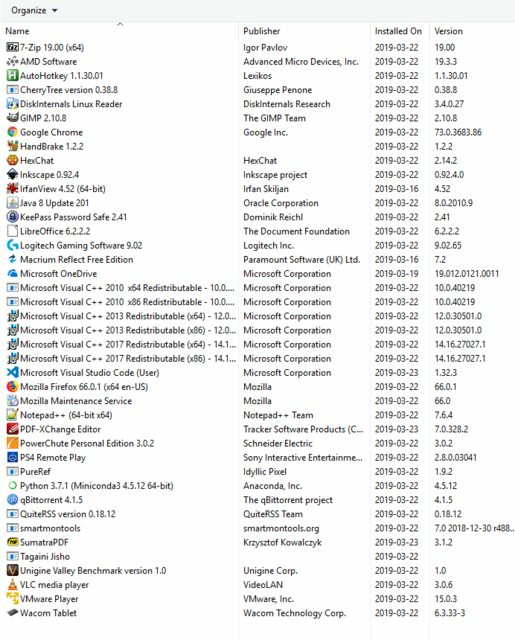 Since it's rather outdated software (it was last updated in 2012; still uses Microsoft .NET Framework 2.0) and it's always been active in the background in my case, that could be a possible culprit. As the memory leak issue can take days to weeks (!) to appear, it could take some time until I can reproduce it. If it does appear again I will try uninstalling the Logitech Software too. A further possible suspect (in my opinion) is from Qt5-based applications which might use/abuse the Wintab API in a way that disrupts the underlying Wacom driver. I have one that has always been active (QuiteRSS). Perhaps importantly, I have a regular mouse (A Logitech G203), and when I'm not using the Wacom stylus I generally use it on the bare surface of the pen tablet (Intuos5 Touch Large). I noticed that the rubberized mouse cable appears to be able to sometimes trigger touch events on some tablet areas. It could be that the cable making on/off contact with the tablet rapidly (possibly as if it was a "bad electrical contact") in such way might occasionally be able to trigger a runaway memory leak event.